Saving Jules: "You don't look sick." What the hell would you know? "You don't look sick." What the hell would you know? 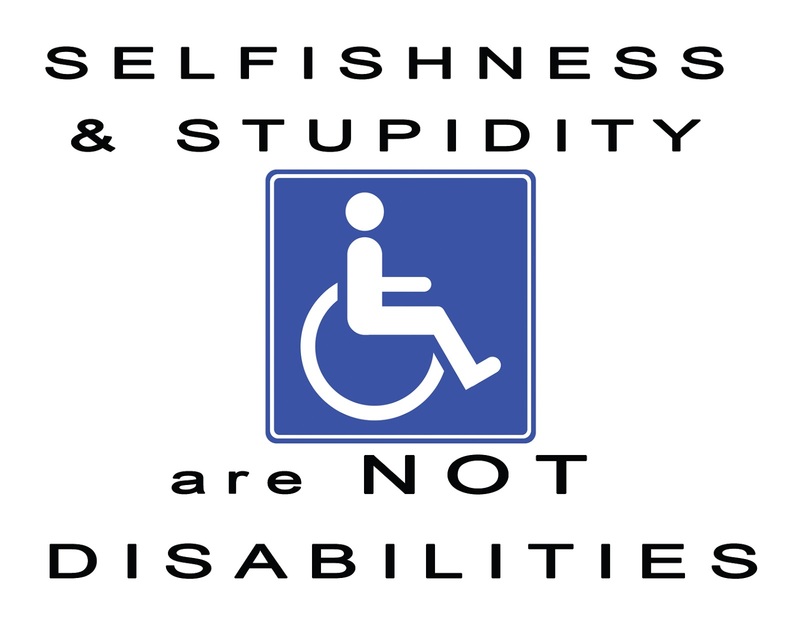 Have you ever looked at a Disabled Car Park, thought to yourself, “I’ll only be a minute” and swung in, even though you don’t have a Permit to use it? Do me a favour – DON’T!!! I cannot believe the amount of people who are willing to use a disabled car park without a legitimate permit. When you do so, you are taking a car park away from someone who needs it a hell of a lot more than an able bodied person does! There are a great many ‘invisible’ conditions where people need to use a disabled car park, so don’t assume that the person who has just walked – seemingly able bodied – away from their car is using someone else's permit. There are days where Julian needs to use these car parks, but doesn’t necessarily need his wheelchair, and I have lost count of the amount of times Nigel and I have been approached by do-gooders accusing us of not needing the car park, of using someone else’s permit, or simply being glared at and pointed at from afar. 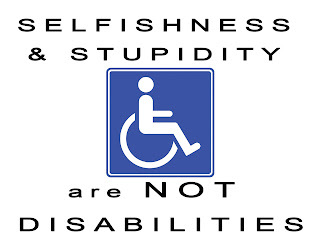 Just because a person isn’t using a walking aide, in a wheelchair or has ‘obvious’ medical problems, that doesn’t mean they aren’t ill.
Oh, and if you are in a disabled car park without a legitimate permit, don’t get pissy with those of us who do need it and ask that you move! I remember one particular time when I approached a man who was parked in a disabled car park and asked him to move (he didn’t have a permit) and his response was, “My wife has a sore knee. What’s wrong with you, you don’t look sick? !” I’m afraid I wasn’t very polite when I told him that we had every right to use the car park and to move before I called the police – they probably would have cared about as much about his wife’s sore knee as I did. This moron very nearly – and deliberately – backed into our car when he moved, hands gesturing the whole time. I don’t care if you have a sore knee. I don’t care if you were ‘only going to be a minute’ (I’ve even heard this from Australia Post delivery agents), and I don’t care if you think I don’t look sick. I’m not. But what the hell would you know?! What gives you the right to question me??? I have a legitimate permit displayed on my car, you don't. 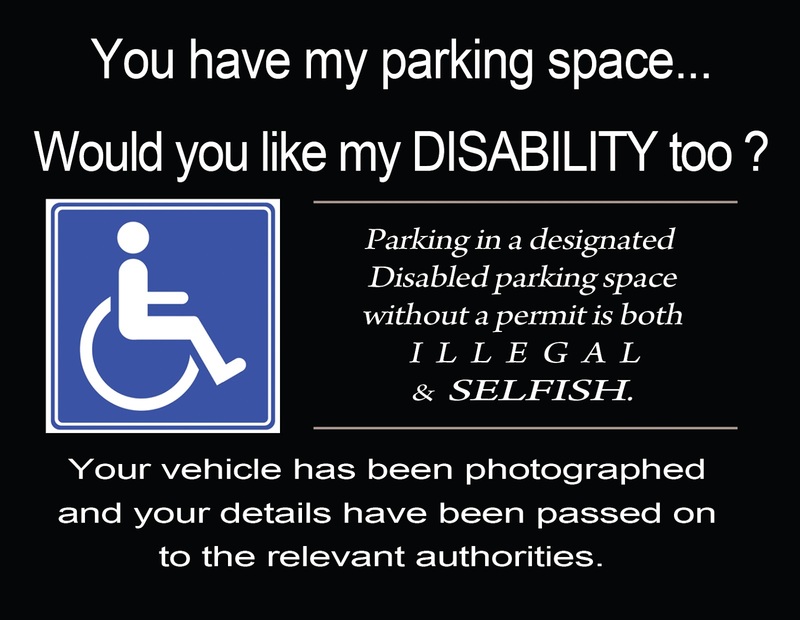 I don’t need to explain to every person I ‘remind’ they’re parked illegally, or the person who is glaring at me from afar, why we need – and are legally able – to use a disabled car park. I will let you know though, in no uncertain terms, despite the fact that it’s none of your business. Ever. Didn’t your parents teach you any manners? Just get out of the car park if you’re not supposed to be in it!!! Nigel and I are at the point where we will just park you in. Want to call the police because of this? Go ahead. I dare you. I’ll cop the fine – but so will you. 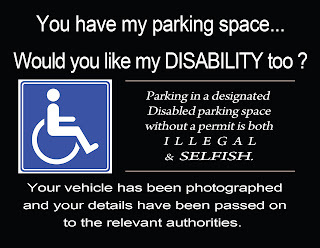 The next time you park in a disabled car park and don’t have a permit showing, you may find one of these postcards on your windscreen. People need to realise that these car parks are there for the safety of those who need them. It's very hard to approach people who park in them without a legitimate sticker (or a pram!) - they tend to get nasty when you point it out to them. As A Mother, Do You Know?